CRMs help you convert leads and retain clients. They can track data to give you insights into where your leads are coming from, the time it takes for a lead to make it through the sales funnel, and what qualifies a lead. A CRM with the right data and tools can help you convert more leads by identifying the best ROI for marketing and highlighting problems in your sales funnel. 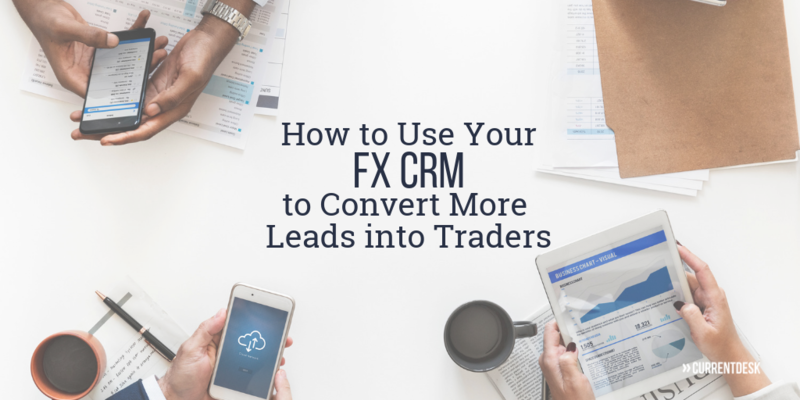 When you use your FX CRM to its full potential, it can help you turn leads into active traders. Use your CRM to identify where a lead came from—a marketing email, a client referral, a click from a Google ad, etc. If you have a contact form on your website, ask people how they heard about you on the contact form. If a lead reaches out to a broker directly, the broker can ask how the lead heard about your firm. Your CRM should have a place where that information can be automatically imported or entered manually. Knowing where leads are coming from means you’ll be able to focus your advertising budget on the most effective channels. Knowing where leads come from helps you focus your marketing efforts, but you’ll get a better ROI when you narrow in on which lead sources bring you people who convert, meaning they actually become clients. To get this important data, your CRM should be able to create a report that distinguishes between the number of leads a marketing campaign has generated and the amount of revenue it has generated. Then, you can spend your marketing money on channels that produce the most profitable leads. Once leads are in your system, it should be easy for you to track what actions have been taken with them. You need to know whether anyone has called them and whether they seem like a qualified lead. Use your forex CRM to track a lead’s status, so you can take the next steps or ask an IB to do so. Monitoring lead status will also allow you to identify bottlenecks in your sales funnel. You won’t know if there’s a particular point where leads are dropping off or where no one’s contacting them quickly unless you’re tracking lead status. Demo accounts let leads try their hand at trading without investing any money. If you have the right FX CRM, these accounts also give you a lot of info about potential clients so you can market to them correctly. Simply looking at which leads are most active on their demo accounts can help you see who’s really interested and who just had a passing interest in forex trading. If you have a hybrid model and mix both market maker and ENC/STP services, then actions on demo accounts can also indicate whether it might be better to have the lead as an A Book or B Book client. Many leads drop off when it comes to actually funding an account, and many new traders make one deposit but don’t make subsequent deposits if they lose their initial investment. 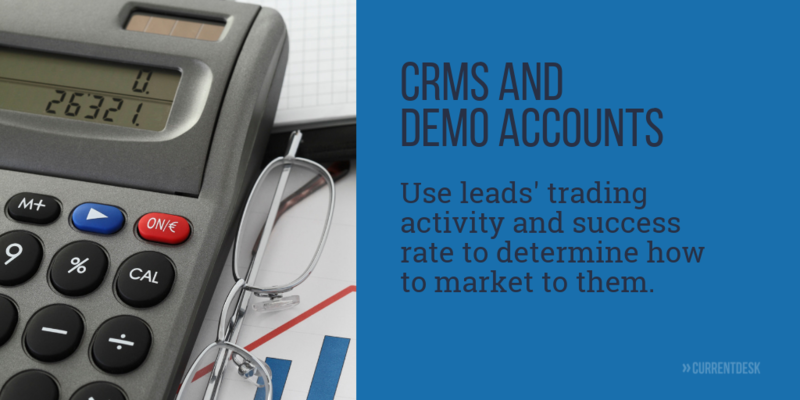 To maximize the number of leads and clients who become and remain active, regularly use your CRM to generate a report with a list of all the clients in your system that have an unfunded account. This list will identify leads you need to follow up with and show which clients may need to be re-engaged. The more you know about clients, the better your can target email campaigns to existing clients to boost trading activity and improve retention. Use your CRM to target clients with specific profiles and provide them information they’d be interested in. For example, create a group with all clients in China who speak Chinese and make trades involving gold. Then, target those clients with promos involving trading gold and written in Chinese. These kinds of personalized ads can prompt clients to be more active traders and prevent them from leaving. CRM software makes it possible to provide this personalization without manually looking at client account activity. CRMs created specifically for forex brokerages will have the tools you need to capture information for turning leads into clients. If you’re looking for a new CRM, contact CurrentDesk to see how we can help your business. 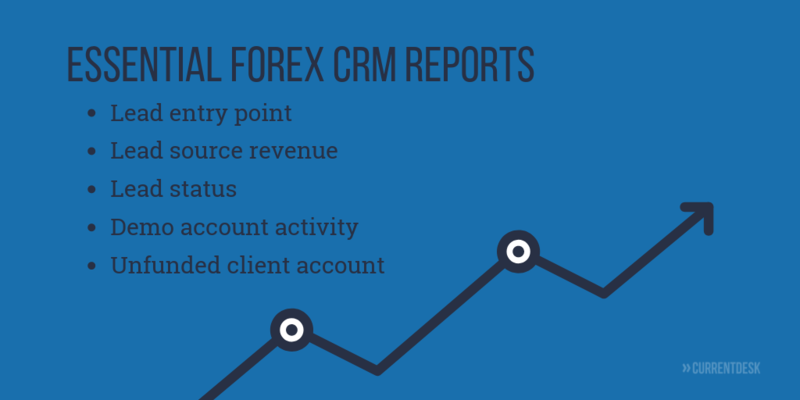 If you’re not sure what all you need in your next CRM, check out 11 Features in the Best Forex CRMs.